This is my latest article published on Seeking Alpha. I tried to put the current oil crash in historical context. I found some very striking resemble with the problems of today’s oil industry and the ones in the late 19th century. I also want to take the occasion to wish everyone a Merry Christmas and Happy Holidays. May 2016 bring good health, prosperity, success and peace. I’m currently reading Titan by Ron Chernow. This is an excellent book about the life of John D. Rockefeller Sr. (July 8, 1839 – May 23, 1937, Obituary from the New-York Times). Mr. Rockefeller was known as the co-founder of theStandard Oil Company and was the world’s richest person. Adjusted for inflation, his fortune upon his death in 1937 stood at $336 billion according to Fortune (in 2008 U.S. dollars). Chernow does a great job shining a light on the secretive mysterious John D. Rockefeller. The biography is fair. Unlike other works about Rockefeller, Chernow doesn’t demonize or canonize Rockefeller in his book. I’m writing this article because of the striking resemblance with today’s oil industry and the one in the book. I’m referring to the late 19th century. I want to share with you some insights between back then and today. You will get the feeling that you were reading today’s oil news. I believe that history repeats itself and there are lessons to be learned. And since this boom and bust cycle are not new, it might also provide some understanding on where we are heading. I hope you enjoy. To understand where this is going, it’s important to understand how we got here. Source: Public Domain. 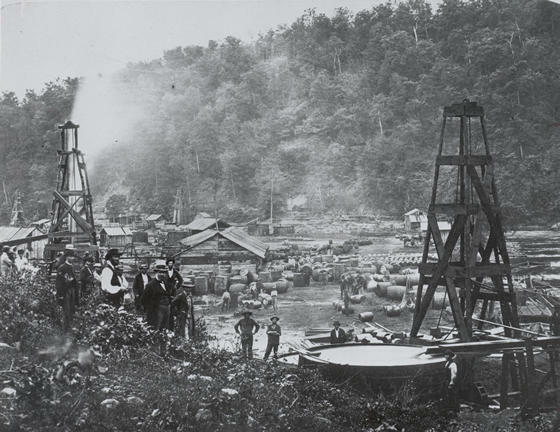 A Pennsylvanian oil field in 1862. In the 1850s the whale fisheries had failed to keep pace with the mounting need for illuminating oil, forcing the price of whale oil higher and making illumination costly for ordinary Americans. Only the affluent could afford to light their parlors every evening. There were many other lighting options such as lard oil among others but no cheap illuminant that burned in a bright, clean, safe manner. George Bissell, considered as the father of the American oil industry, had the intuition that oil that was plentiful in western Pennsylvania could be a first rate illuminant. The slimy liquid was so ubiquitous that it tainted well water and plagued local contractors drilling for salt. In 1855,Professor Benjamin Silliman from Yale produced a report that vindicated Bissell’s hunch that oil could be distilled to produce a fine illuminant (like kerosene), plus a host of other useful products. As a result, Bissel and his company, Seneca Oil Company (formerly the Pennsylvania Rock Oil Company) needed to dispatch someone to Pennsylvania to look for large pools of oil. That man was Colonel Edwin Drake, known as the first to successfully drill for oil. Drake arrived in Titusville, Oil Creek Valley. Oil was known to exist here, but there was no practical way to extract it. Its main use at that time had been as a medicine for both animals and humans. Natives used it for war paint and for soothing skin liniment. It took a couple years but Drake struck oil in 1859. This was the beginning of a pandemonium. Bands of fortune seekers and speculators streamed into Titusville and other oil-related businesses quickly exploded on the scene. I guess you can call this the Klondike of oil. Boomtowns appeared briefly, witnessed frantic activity, and then vanished as abruptly as they had appeared. In a short-time after oil is struck, a sleep frontier settlement is transformed into a hectic town filled with hotels and saloons. Pithole, Pennsylvania is an example of that boom to ghost town phenomenon. In 1865, after oil was discovered Pithole became a boomtown with thousands of people rushing in. Then after the oil was gone, Pithole was left with just six voters. The book talks about a $60,000 hotel, the fancy Bonta House hotel, that was sold for $600 for the lumber and doors. Back then nobody knew how much oil there was and it looked as if the oil would be more than a transient phenomenon. The worries that the Pennsylvania oil wells would dry up consumed a lot of energy. In the late 1860s there were stern prophecies about the industry’s impending demise. Today we know that we are not running out of oil anytime soon but how many times are we reminded of the Peak Oil Theory? To a much lesser extreme, this reminds me of North Dakota and Fort McMurray in Alberta. Fort McMurray has a lot of oil left for a few decades but the recent oil crash has brought a lot of pain including a housing bust. Just like western Pennsylvania at the time the potential money to be made in Fort McMurray and North Dakota was irresistible, whether in drilling or in auxiliary services; people could charge many times the asking rate. The oil industry was unruly and turbulent. From its first days, the industry tended to oscillate between extremes: gluts so dire that prices plummeted below production costs or shortages that sent prices skyward but raised the even more specter of oil running dry. Prices back then were volatile with the supply-demand equation shifting radically each time a new gusher came in. It was never clear where prices would settle or what constituted a normal price. When this expanded supply led to lower prices and deflationary bust, it set the pattern for the rest of the 19th century, which experienced huge economic advances, punctuated by treacherous slumps. Lured by easy profits, legions of investors rushed into a promising new field and when big gluts developed from overproduction, they found it impossible to recoup their investment. In 1861 a barrel of oil fluctuated between $10 and 10¢ a barrel! And that’s not a typo. In 1864 a barrel fluctuated between $4 and $12, and then fell to $2.40 a barrel after the Civil War. Does this remind you of today’s boom and bust environment? 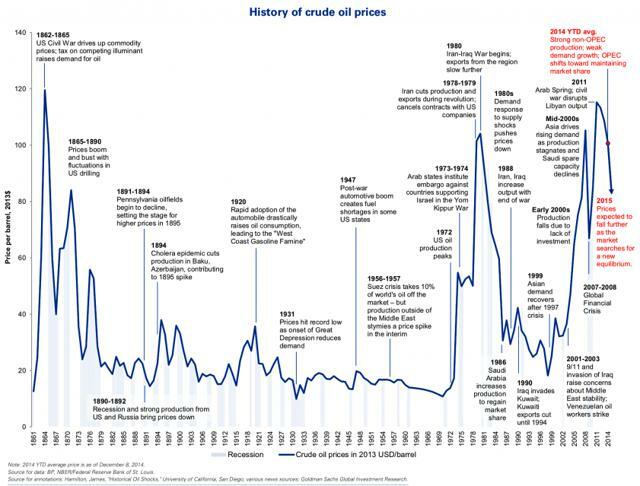 Below is a chart of the history of crude oil prices. (click to enlarge) Source: Goldman Sachs. Data up to 2014. By the late 1860s, there was a slump in the oil industry, keeping it depressed for the next five years. Low kerosene prices, a boon to consumers, were catastrophic for refiners, who saw the profit margin between crude and refined oil prices shrink to a vanishing point. In 1870 total refining capacity tripled the amount of crude oil being pumped and most refineries were in the red. Now the downstream businesses will feel the pain of a slump in refining margins. Refining margins are starting to slump. Barclays’s benchmark puts average margins in the fourth quarter about 45% lower than the prior quarter. Worse, the oil market wasn’t correcting itself according to the self-regulating mechanism described by neoclassical economists. Producers and refiners didn’t shut down operations in the expected numbers. John D. Rockefeller said “So many wells were flowing that the price of oil kept falling, yet they went right on drilling.” Rockefeller tirelessly mocked those “academic enthusiasts” and “sentimentalists” who expected business to conform to their tidy competitive models. According to the standard model of competition, as oil prices fell below production costs, refiners and producers should have shutdown. But the oil market didn’t correct itself in this manner because refiners and producers carried heavy bank debt and other fixed costs and by operating at a loss they could still service some debt. Each refiner, pursuing his own self-interest, generated collective misery. Does it sound like today’s news? The U.S. drilling activity didn’t slow down as much as expected and a lot of producers are still pumping oil to avoid defaulting on their loans. The Oil Regions of Pennsylvania created many millionaires and left many more paupers. Many who had made easy fortunes in oil found themselves bankrupt. Now how many people have lost their shirt in the latest oil crash? People are losing their jobs, loans are defaulting, fortunes have melted, income going to retirees is gone, oil dependent countries are falling apart, and the carnage continues. People who succeeded believed in the long-term prospect of the business and never treated it as a mirage that would soon fade. That’s what John D. Rockefeller and Standard Oil did. The violent price swing created an urgent need for certainty, stability, order, and predictability. The solution back then was forming a cartel with the leading producers. In 1869 and 1870 are the years cited by Rockefeller as the start of his campaign to replace competition with cooperation. On February 1, 1869, the Petroleum Producers’ Association was created to curtail production and lift prices. According to Rockefeller the industry needed to be tamed and disciplined since it was struggling with excess capacity and suicidal price wars. That’s almost hundred years before the Organization of the Petroleum Exporting Countries (OPEC) that was formed in 1960. Standard Oil ran “running arrangements” with its rivals in which Standard Oil guaranteed them a certain level of profits if they accepted a ceiling on their output. This caused the problem all the cartels face: How do you prevent cheaters. Whenever refiners with running arrangements exceeded their assignment allotment, Standard Oil, as the swing producer, curtailed its own output to maintain prices. This is exactly the situation Saudi Arabia has been facing since the 1970s. Cheaters are not the only problem for the cartel, it also had to grapple with the “free rider” problem. That is opportunistic refiners outside the cartel who enjoyed the higher prices it produced without being bound by its production limits. In the end the agreement crumbled because producers couldn’t enforce discipline in their ranks. High prices lead to producers to pump more leading to another major glut in the market. In today’s world, the biggest free riders are Russia, the U.S., and Canada among others. They benefit from OPEC’s output restrictions and counted on the organization to curb output to support price. Well that mutual belief fell apart and so did the floor that the oil price was standing on. A year ago OPEC, influenced by Saudi Arabia, decided to defend market share instead of cutting output, ultimately hoping to drive high-cost producers such as U.S. shale firms out of the market. OPEC’s decision last Friday in Vienna is escalation of that policy. OPEC will not limit oil production. OPEC says it shouldn’t have to cut output alone and there’s really no appetite to cut, especially from Iran. OPEC historically functioned for so long because they were able to coordinately restrict supply and therefore influence oil prices. Now they have dropped their founding mission to operate in a free-for-all ceilingless production environment in an already oversupplied market. As a side note, most of the stuff refineries produced back then was kerosene. This was years before the introduction of the automobile. Nobody knew what do to do with the light fraction of crude oil known as gasoline and many refiners let this waste product run into the river. Rockefeller said “we used to burn for fuel in distilling oil and thousands and hundreds of thousands of barrels of it floated down the creeks and rivers, and the ground was saturated with it, in the constant effort to get rid of it.” And because the industry was so out of control and that voluntary association didn’t work, John D. Rockefeller wanted to bring the industry to heel under Standard Oil control. As for Pennsylvania, oil production peaked in 1891, when the state produced 31 million barrels of oil, 58 percent of the nation’s oil that year. Standard Oil became a monopoly and the world’s first and largest multinational corporations. The Federal Government dismembered Standard Oil in 1911 into dozens of constituent companies. The oil market is disconnected from fundamentals. The oil industry is a victim of over production at any cost. Producers are focusing on protecting market share even if that means selling barrels below cost. Others are still filling up inventory space just because they need to pay interest on their loans. The market, instead of acting on fundamentals, is trading on momentum. Low prices are the excuses for lower prices. We are never at the center, or in equilibrium. We are always to the left or to the right of the pendulum. And when the market corrects itself it shoots past equilibrium and goes straight the other way. The latest oil boom is responsible for the recent bust as it happened in the late 19th century in Pennsylvania after discovering a new big gusher. With high prices and sky-high profits, the field had soon grown overcrowded. Supply didn’t follow demand. When oil prices were high, capital expenditure exploded and producers drilled everywhere. The feeling was that oil prices were only going to go up. Oil booms and busts happened frequently in the past, except today we though that “time is different”. The thesis was the age of cheap oil was over because of the ever growing oil thirst of China and the rising demand in emerging markets. Well the thesis is still more or less relevant, it addressed the demand side of the equation. The issues are on the supply side of the market and latest developments set up for more price wars in an already heavily oversupplied market. We might be in 2015 and we might think of ourselves as smart and sophisticated. Our society doesn’t look anything like the wild one described in the 1800s. However, even if our society is more advance, our behavior didn’t evolve and as a result we repeat the same mistakes of the past. When you think things couldn’t get uglier, they do. As for me, I will try to finish that 774 page oil brick.